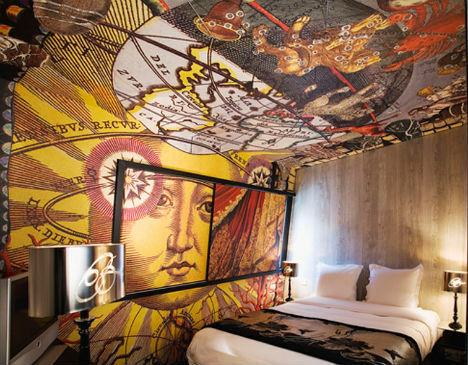 Indulge in your James Bond fantasy and lounge in a 007-worthy suite complete with a revolver-shaped lamp, or step into the mind of famed fashion designer Christian Lacroix. 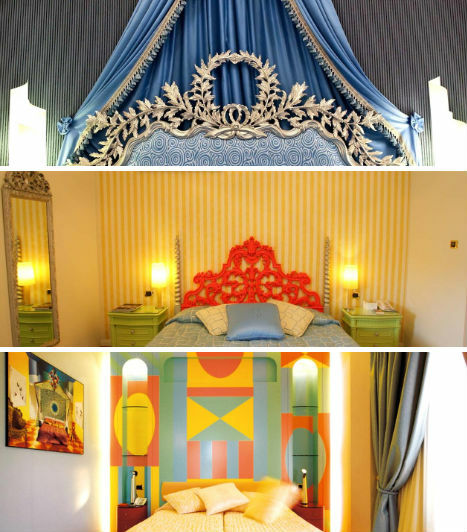 When all of this and more is possible, why not make your hotel stay a cultural experience in itself with a themed, fantasy or art hotel? From a surprisingly successful clash of Italian classicism and ultra-modern furnishings to a girly getaway worthy of a 21st century Marie Antoinette, these 12 hotel rooms from 5 of the world’s most creative hotels are irresistible eye candy. 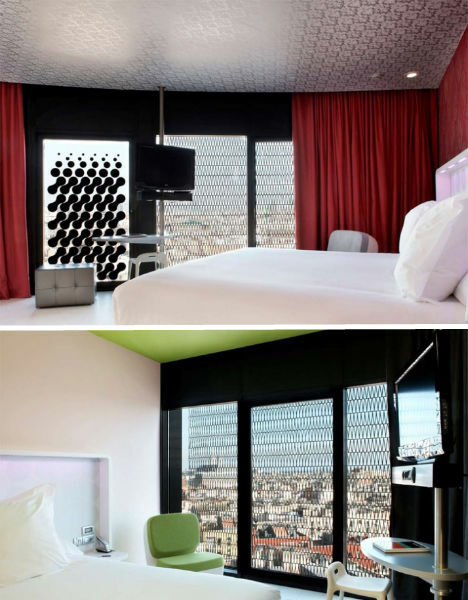 No matter your tastes or even your mood at the moment, Hotel Seven in Paris has a luxury suite that will make you swoon. The 28-room designer hotel features seven incredible themed suites that range from the subtle, tranquil charms of a limited black-and-white palette to a room worthy of – and indeed named after – 007 himself. 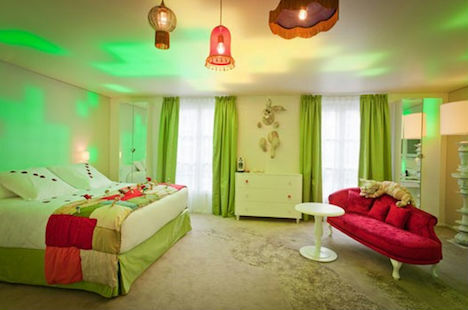 Go down the rabbit hole and spend a night or two in the charmingly childlike “Alice” suite, decked out in shades of lush green and vivid pink with a collection of clocks hanging on one wall and a stuffed rabbit mounted on another. This suite’s most amusing touch is the chess set – playable while seated on the porcelain throne. Those with more aristocratic tastes in the vein of Marie Antoinette – albeit a modernized version of the famous French queen, a la Sofia Coppola – should check out her namesake room. Soft and feminine, the suite has a serene painted sky, many a soft surface upon which to lounge and eat cake, and a bed surrounded by a sheer canopy of cursive-laden curtains. 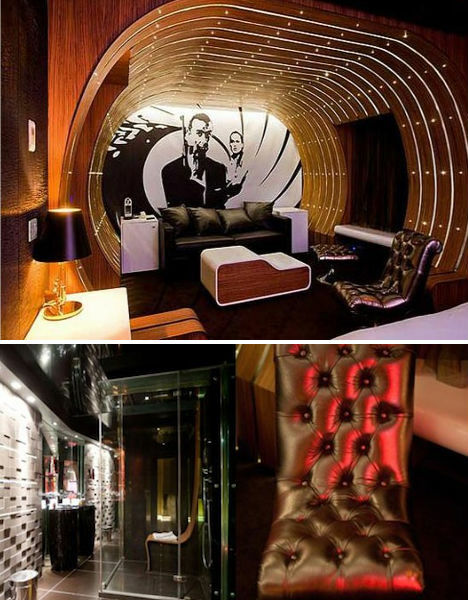 But of course, when James Bond is in the building, everyone else is eclipsed, and indeed, the James Bond suite is the highlight of Hotel Seven. Masculine with a bit of kitsch, this suite is 1960s Sean Connery Bond all the way, with a midcentury lounge in which to drink martinis – shaken, not stirred, naturally – and an eye-catching revolver-shaped lamp. 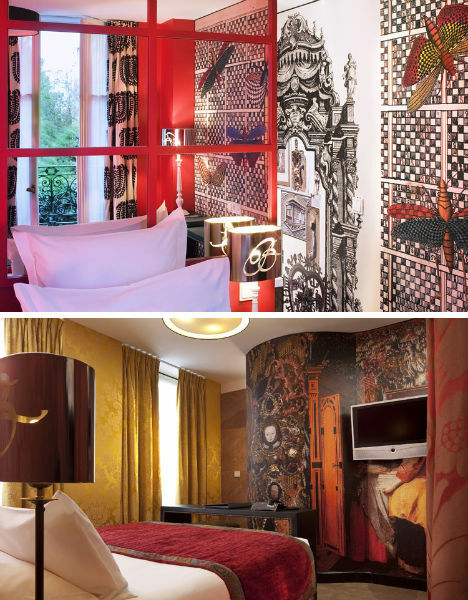 Christian Lacroix has been so busy designing stunning boutique hotels, it’s a wonder that he has had any time for fashion. Just across Paris from his chic and oh-so-French Hotel du Petit Moulin is the dreamy Le Bellechasse with 34 rooms grouped into three categories: Discovery, Original and Privilege. Each category denotes its own particular type of artistic flair, together creating what could be considered equal parts museum-quality exhibits and luxurious digs. Begin with ‘Discovery’ and take a trip through a theatrical and complex visual narrative, in this case consisting of renaissance-era paintings and old world imagery updated with modern touches that keep the design from being staid or predictable. Moving into ‘Original’, you’re suddenly a part of a three-dimensional Victorian decoupage packed with butterflies, suns, moons and other natural subjects. But ‘Privilege’ feels like another hotel altogether, bright and modern with bold prints and colors. When architecture firm CMV Arquitectos and interior designer Jordi Gali took on the renovation of the Barcelo Raval Hotel in Barcelona, they were faced with a unique challenge: the unusual elliptical shape of the building. They solved this problem with a central concrete core that acts as the spine of the building, providing a smoothly flowing space in which the oval is echoed at every turn, becoming a theme for the design as a whole. 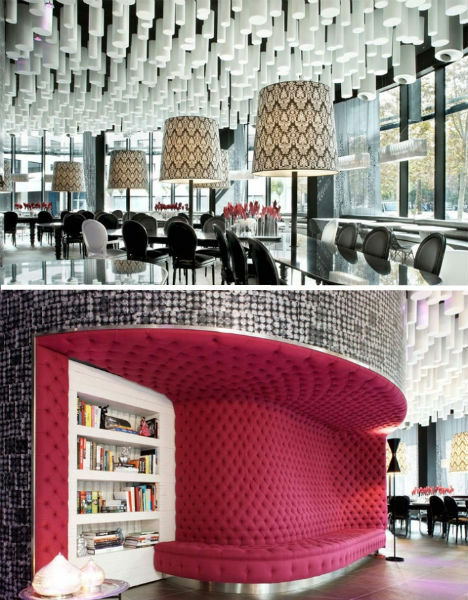 A plush pink seating area and a mass of white foam cylinders hanging from the ceiling make the lounge and bar all eye candy. Upstairs, the guest rooms vary slightly by floor, with varying shades of neon accents, but all are anchored by plenty of sleek black and white surfaces. Open baths with tubs made of Corian look like sculptures, and LED lights in bright colors shine from the white headboards. From the outside, the Byblos Art Hotel could be virtually any elegant manor in the Italian countryside – and indeed, architecturally, the same could be said about the interior. But where some designers might just shrug and go with a classic theme in order to honor the historical elements of the building, Alessandro Mendini took a risk and ultimately created one of the most stunning juxtapositions of old and new in recent memory, artfully combining tray ceilings and crystal chandeliers with spare midcentury-modern furnishings and mod textiles. The hotel is a veritable museum of contemporary art, with works by Frank Lloyd Wright, Anish Kapoor and Beatriz Millar. 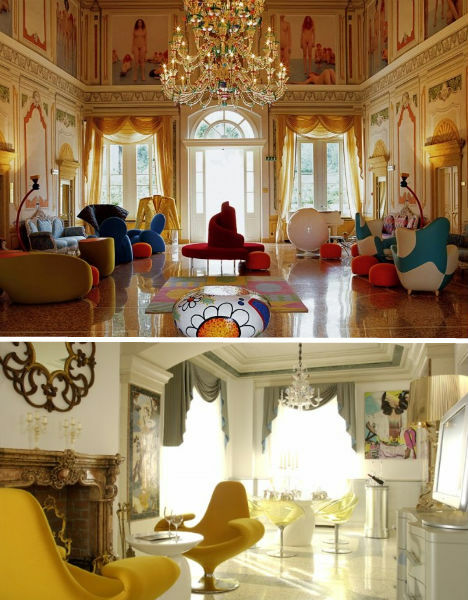 The hotel’s three suites – the Presidential, the Baroque and Mendini’s Cult – continue the design theme in three very different ways. Where the Presidential suite is positively regal and appropriately traditional with plenty of heavy jewel-toned drapery and gilt flourishes, the Baroque Suite is outfitted in cheerful yellow stripes and a coral-red headboard. The Mendini’s Cult suite is practically a shrine to the design of Atelier Mendini, an Italian design firm headed by brothers Alessandro and Francesco Mendini. 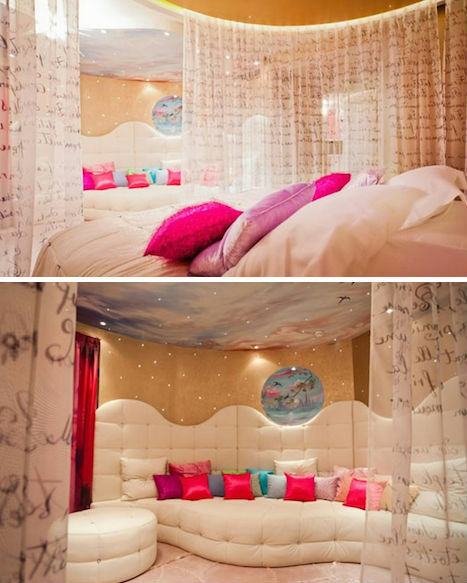 In the 1990s, supermodel Linda Evangelista famously said that she wouldn’t get out of her bed for less than $10,000. 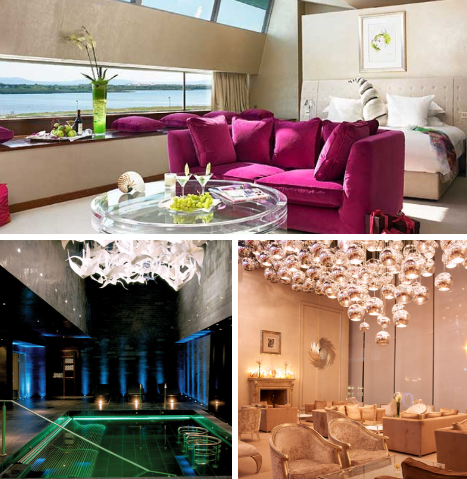 At the G Hotel in Galway, Ireland, you can actually stay in that very bed – once owned by Evangelista herself – in the specialty suite named after the model. 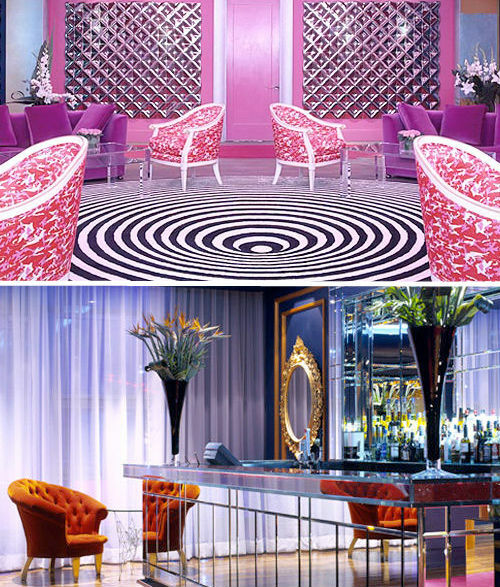 Milliner Philip Treacy has designed some of the most fanciful and whimsical hats in the world, so it’s no wonder that as design director of the G Hotel, he chose bubblegum pink as the main color for the club room. Everywhere you look, there are hints of the elements that Treacy often includes in his wearable creations – from feathery mirrors mounted on the doors to the origami-like bird sculptures that hang from the ceiling in the spa. While the most obvious traces of Treacy’s influence are seen in the communal areas of the hotel, the rooms themselves carry a subtle iteration of the theme with framed illustrations of Treacy’s creations and Frette linens that the milliner designed himself.